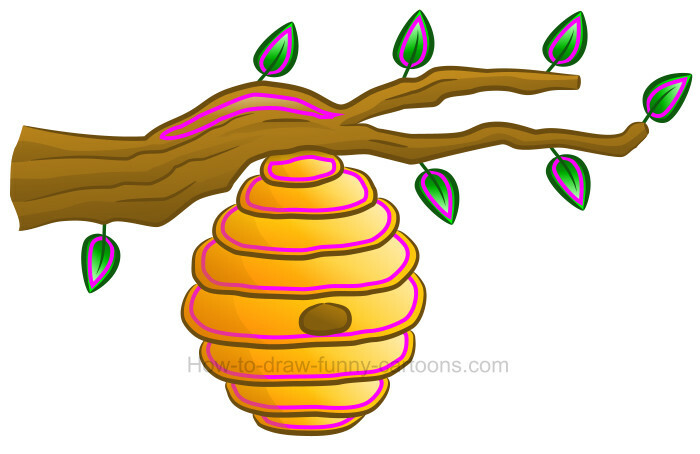 Draw a simple and beautiful beehive clipart filled with bees, colors and fun! Using mostly simple shapes and colors, you will learn how to sketch a basic branch holding a beehive that is surrounded by adorable cartoon bees. A few leaves are also visible. Our goal is to create enough effects to end up with a nice 2D illustration filled with depth and volume. First, you can sketch a branch using a few broken lines as shown below. Then, you can add the cartoon beehive using eight curved lines (with irregular paths). The middle stripe must be larger and all lines are getting smaller as we are reaching both ends. 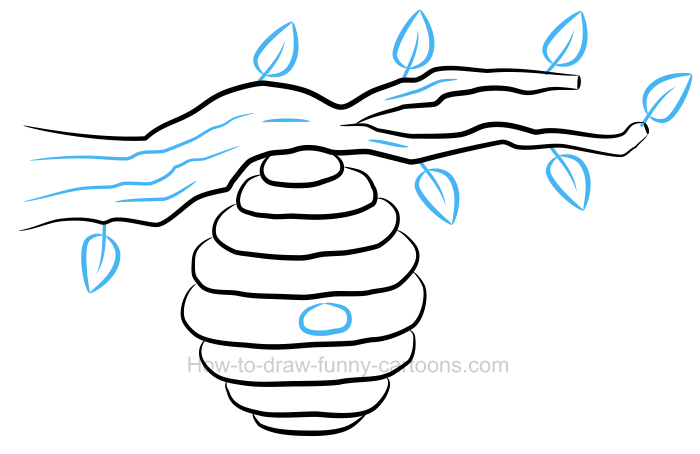 Make sure the beehive is located near the middle of the branch (near a strong a thick portion of the branch). 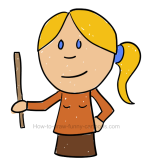 Around the branch, you can draw a few leaves using more curved lines. 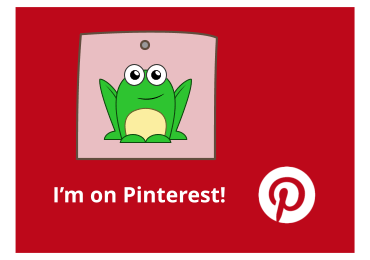 Don't forget to use pointed lines to create a more interesting image. Inside the branch, sketch a few broken lines to form texture. Finally, a small hole can be added inside the beehive clipart. Now that the main object is drawn, let's proceed with colors. 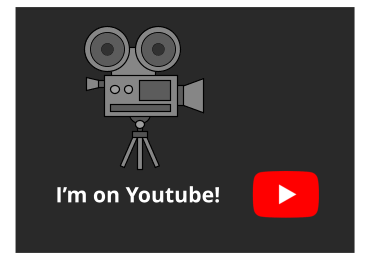 We will add adorable bees later in this tutorial. 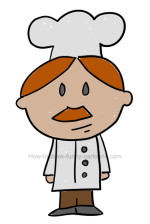 Inside the illustration, you can now add plain colors to make the illustration visually more appealing. The branch is brown and all leaves are colored in green. You can use a saturated yellow / orange color inside the cartoon beehive. 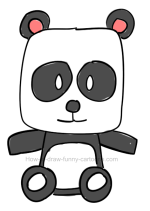 It's also a good idea to use colors inside the lines and strokes instead of keeping the black color already used. The drawing will be more interesting if black colors are only used when needed. If you are using a vector application (which you should since it's easier to end up with a cool result), then you can add color gradients inside all elements of the drawing to add more volume. As you can see below, the leaves are now darker near the branch and brighter on top. The same technique is used on all layers found inside the beehive. The branch is also darker on the bottom. 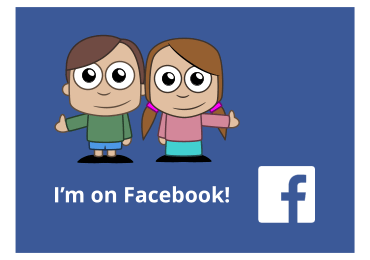 It's a simple, but cool tip to enhance any cartoon illustration. 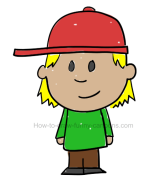 No doubt that color gradients are useful to create depth inside a cartoon picture. However, nothing is more effective than adding more shadows manually by drawing new shapes. Of course, these new shapes must be darker to create the desired effect. It's also a good idea to make these new shapes partially transparent. Our goal is to come up with a subtle result, not a dramatic picture with dark and strong shadows. You can see all these new shapes below (with temporary pink outlines). Highlights and reflections are also valuable tools to use in a beautiful 2D image like this one. Adding bright areas is not only visually appealing, but it also puts emphasis on the shadows created in the previous step. 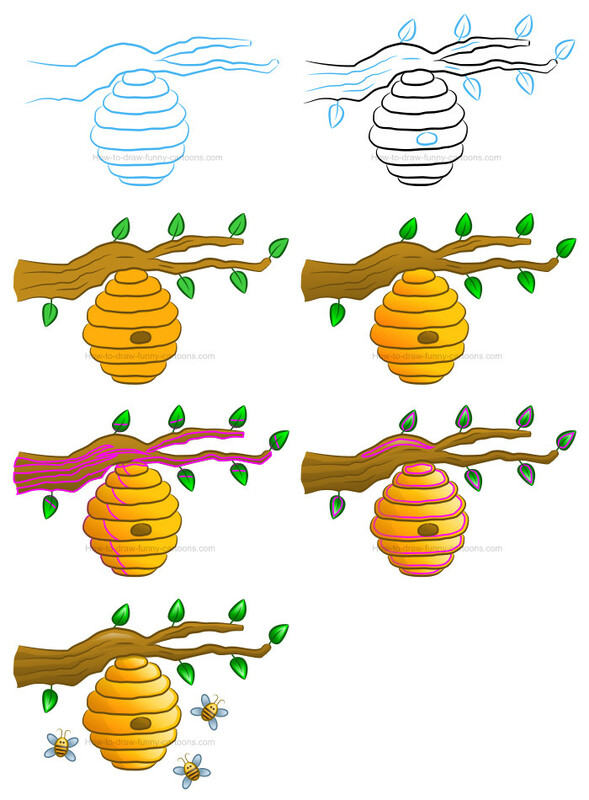 See how the right side of the beehive clipart is now richer and brighter? Don't forget to play with the opacity of these new elements. Just like shadows created earlier, we want a subtle result! 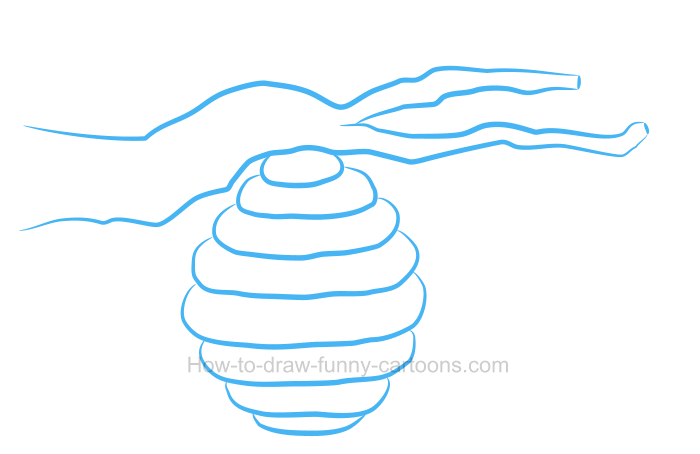 Around the cartoon beehive, we can add a few bees made from simple shapes and lines. Four simple steps are needed to draw this fun insect. 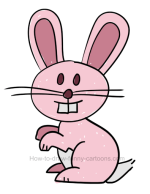 First, use circles, oval shapes and lines to draw the animal. 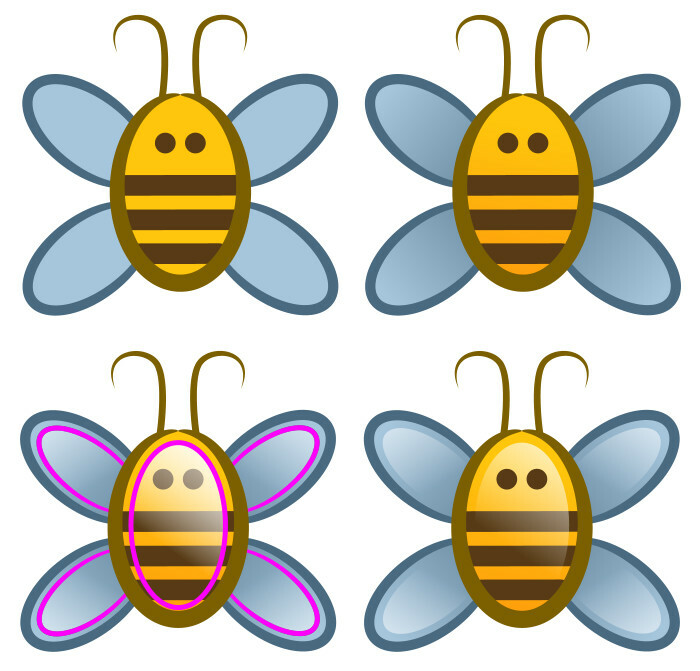 Then, add color gradients and highlights inside the bees to complete this simple step. No need to draw complex details. These insects are small and are only used to enhance the main illustration. 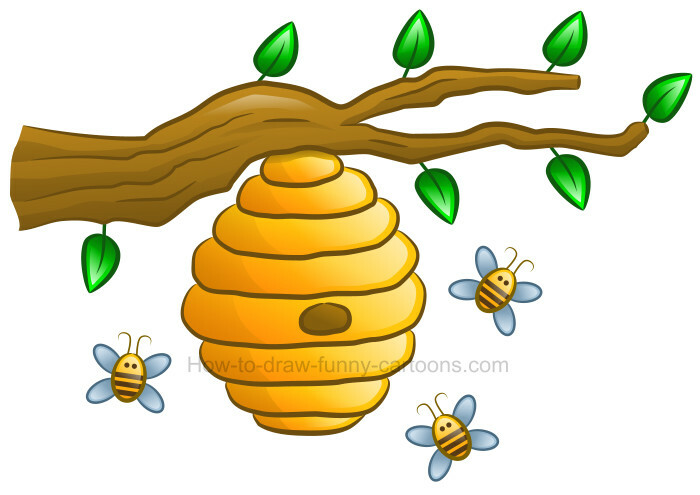 a nice beehive clipart made from simple elements!